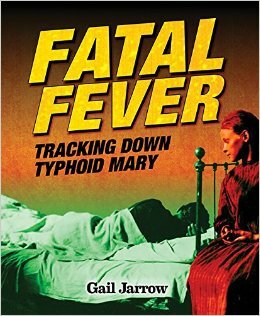 Following her medical detective story about pellagra (Red Madness, 2014), Ms. Jarrow now tackles the rise and fall of typhoid in this attractively presented and readable narrative nonfiction account. Mary Mallon is at the center of the narrative as “the first case of a healthy typhoid carrier ever found in the United States.” As a cook for many wealthy families she had inadvertently spread the disease, though remained rosy-cheeked with health herself. In the race to track her down, we meet sanitation engineer, George Soper aka the germ detective, Dr Josephine Baker who eventually brings her in and others who worked in the public health arena to bring this epidemic under control. Once Mary Mallon is detained, despite her protestations of her innocence, she is isolated against her will, ultimately for the rest of her life. Ms. Jarrow is a skilled historical writer, using primary documents including letters, reports and journals to weave a clear and interesting story of a time not too long ago when clean water and robust sanitation was not the norm. The use of contemporary photographs is exemplary, adding interest and illuminating the text. The main narrative flows well, and three significant color-coded detours fill out important information on the disease itself, the science of carrying a disease and other healthy carriers who never had the notoriety of Ms Mallon. Extensive and interesting back matter gives a list of famous typhoid victims, a timeline and glossary, as well as detailed source notes, a bibliography and books and websites for more information. However, there are few primary sources about Mary Mallon herself, and this leaves something of an emotional hole at the heart of the book. The central moral dilemma about the rights of an individual versus the health of the general population resonates with today’s debate about vaccines, but is really only drawn out in the author’s note at the end. This larger format book, with colorful design, and a well-organized and spacious layout including chapters broken into short sections, is a great book for a middle grader to read for either interest or for a school project. This graphic novel, inspired by the author’s family, is a hard-hitting introduction to the internment of Japanese-Americans during World War II. Koji Miyamoto turns 13 on December 7, 1941 – the day that Japanese fighter planes attacked Pearl Harbor. Eventually Koji is sent to a “relocation camp” accompanied by his Caucasian mother. 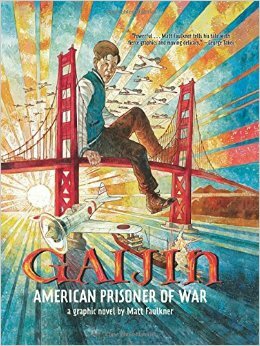 Having faced abuse and prejudice from white Americans in his hometown of San Francisco, he now faces the same from a gang of young Japanese men in the camp who call him “gaijin” (foreigner). Haunted by dreams of his absent father, Koji rebels and joins the gang in an attempt to escape the camp. This is a good first stop for middle graders interested in the controversial topic of the effective imprisonment of thousands of Japanese Americans, though it lacks the weight for a high school read. It shows the speed and inequity of how the process was managed – people lost their possessions, their homes and their businesses – but also the stoicism and dignity with which many Japanese Americans faced it. However, the story only covers the first few months, when Koji and his mother are put into a holding camp; it ends when they are being transported to Camp Agua Dulce, a stand-in for the Manzanar Camp. The narrative is short and unadorned, but is greatly expanded by the painterly illustrations. The large, often full page, panels, in earthy ochres with muted blues accents, are filled with distinctly drawn people, with often caricature-ish features. 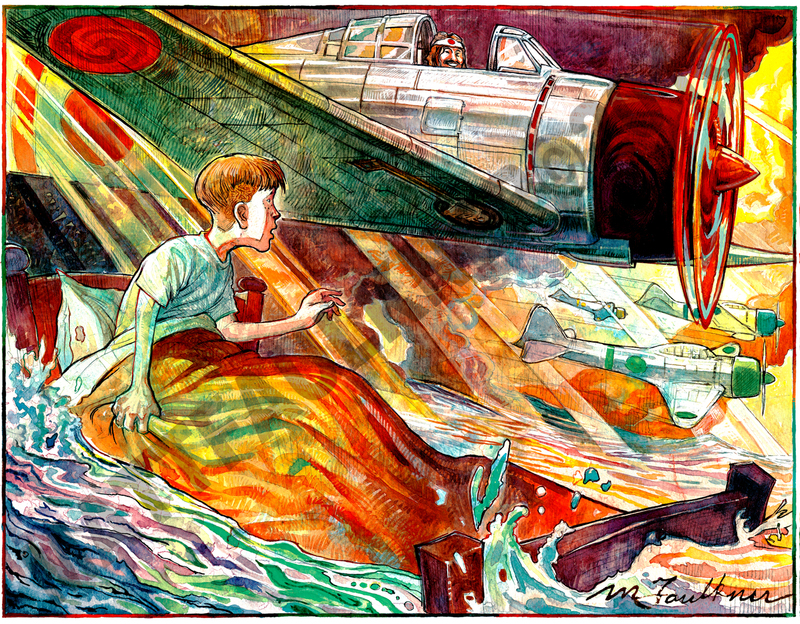 Koji’s dreams of his father burn bright with reds and greens, and break through the limits of the panels. The author includes his family story in the backmatter, as well as some selected resources for further information. Interested middle grade readers might want to look at nonfiction accounts including Remembering Manzanar by Michael L. Cooper (Clarion, 2002) and the anthology Only What We Could Carry (Heyday, 2000). I’ll Give You the Sun by Jandy Nelson is by far the most read review. 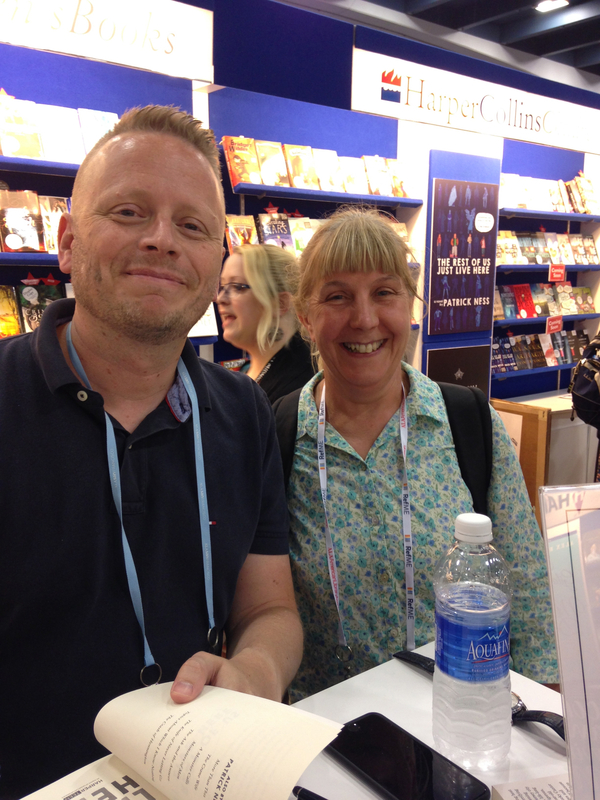 I meet Ms. Nelson recently at the ALA conference and she was quite charming. She is very excited about the upcoming movie of this novel, though I have to say I have my concerns. The Perfect Letter by Chris Harrison is the gift that keeps on bringing people to my blog. They don’t usually stay for very long though. Wild Rover No More by L. A. Meyer is the last book in a hugely popular and well-loved series, though bibliobrit readers often appear to be looking for spoilers. Here’s your opportunity to go back and read them. They’re really not that bad, and they’re about books that are really good. She is Not Invisible by Marcus Sedgwick is a terrific book by an author who always delivers something thoughtful. The Night Gardener by Jonathan Auxier is a cracking good fantasy/horror story. It did bubble around the edges of Newbery discussions too, though is perhaps a bit too genre for that award. Grasshopper Jungle by Andrew Smith is a funny, raunchy scifi thriller that won a Printz honor. So, let’s cut the cake and pop the cork! and here’s to a second year of bibliobrit. Feel free to let me know if there’s anything you like or don’t like about the blog, and if there’s some books you think I should add to my TBR pile. 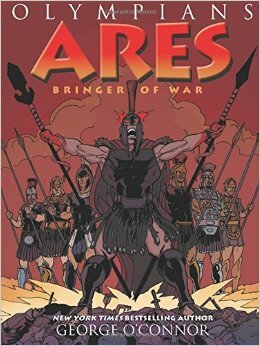 Unlike other more biographical entries in The Olympians series, this graphic novel version of Homer’s Iliad brings to life what I recall, from O’Level Classical Studies, being a rather dry read about the Trojan War. This shows the gods watching the war from Mount Olympus like a video game, with some rooting for the Greeks and some for the Trojans, depending on a complex and incestuous web of connections (luckily Mr O’Connor gives us the doozy of a family tree on the inside front cover). The introductory section explains the differences between the two gods of war: Athena is about strategy and is “the voice that speaks reason in the heat of battle” whereas Ares lives in “the chaos, the confusion, and the horror” that can overtake soldiers “when the best laid plans have gone awry.” As the gods help their favorites and seek vengeance for slights, the Greeks and Trojans are just pawns in a game that eventually the gods lose interest in after Achilles defiles the body of Hector. The book finishes, a little lamely, with a whirlwind page on the rest of the Trojan War, much as the Iliad does. The color panels in Troy move between cool blues for Athena’s strategy and rusty/earthy reds and browns for the blood-soaked visceral rampaging of Ares. The minimalist, neutral and serene Olympus reflects the ennui and omniscience of the gods. It is encouraging to note that both mortals and immortals have a diverse range of skin tones. However, and maybe I’m reading too much into this, I’m a little uneasy that Ares, the raging, and bloodthirsty god, is the only dark-skinned male as it feels like it plays to the Scary Black Man trope. The end notes are fun, as Mr O’Connor gives some entertaining information about how he used details from the Iliad to inform his story and illustrations, including the tidbit that gods weigh more than mortals. This is a hugely popular series with upper elementary/middle school kids (and older) and there’s no reason why this should not continue the trend. 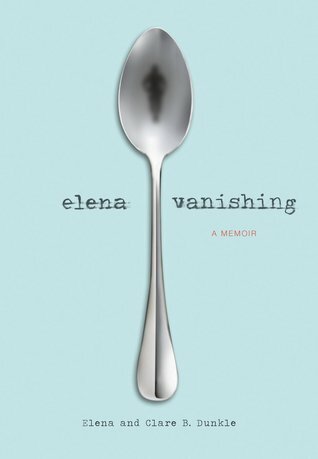 This grueling and intense memoir covers the many years that Elena Dunkle was treated for anorexia, and is published simultaneously with Clare B. Dunkle’s Hope and Other Luxuries, which gives her mother’s perspective. The daughter’s story is a challenging read, as for two-thirds of the book we are in the head of a young woman whose life revolves around her number – what she weighs – and who is driven by a harshly critical inner voice, goading her on all the time. Elena is an overachieving perfectionist, and scoffs at the idea of an eating disorder: “The meal-skipping I do these days isn’t a disorder because it never lacks order.” She is a control freak, super-organized and never without a planned day. She shows the tenacity and cunning of an anorexic – perfecting the art of silent vomiting, secreting BB pellets in her bra when she goes to be weighed, buying drinks with lids so no-one can see what she is, or more likely isn’t, consuming. As the doctors and therapists delve to find out “What Went Wrong”, the treatments Elena receives often appear cruel, and her parents, both scapegoats and martyrs, seem to be flailing in the dark. It is only after her sister has a baby, Elena herself miscarries, and finally opens the door to a memory from when she was 13, that she is at last ready to start on the road to healing. Even then, “recovery is a path not a destination,” and it takes many more months for her to feel she has begun to shake off the shackles of her addiction. An author’s note at the end is clear that this should not be used as a blueprint for either anorexia or for treating anorexia, and gives some resources for those who are struggling with eating disorders. However, I would still be reluctant to recommend this to any teen girl, as the tone of the majority of the book is triumphant about restricting intake, purging and over-exercising. Even I, as an adult with no particular issue with food, felt quite odd about eating as I was reading this book. In this charming, funny and thoughtful novel for upper elementary and lower middle school students, 12 year old Sophie Brown is feeling lost and sad when her family moves from an apartment in LA to her dead great-uncle Jim’s run-down farm after her father loses his job. So when a highly unusual chicken, which Sophie names Henrietta, turns up, Sophie is determined to keep her and the rest of the decidedly odd chickens that subsequently appear. Written as a series of letters from Sophie to her departed grandmother and great-uncle Jim, as well as to Redwood Farm Supply, source of the peculiar chickens, Sophie’s shy, optimistic, resilient and persistent personality shines through. 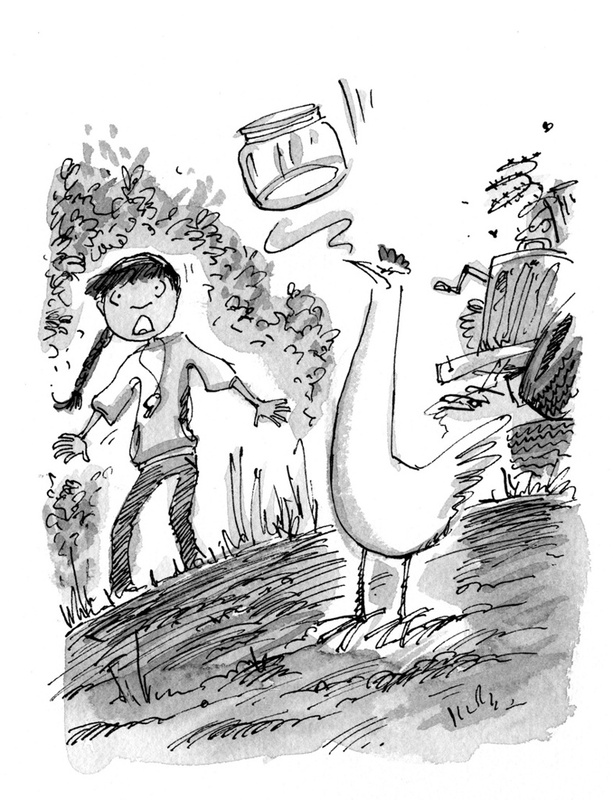 The simple black and white illustrations are bursting with energy and personality, particularly those of the chickens including the perpetually pissed off Henrietta, at the top of the pecking order. And the one of Sophie and her parents’ dance party is a warmhearted snapshot, adding insight to their relationship. 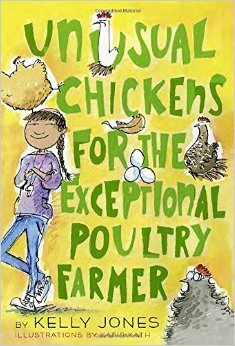 As the chickens open up some social possibilities for Sophie, and her family’s finances stabilize a little, the novel ends on a satisfying note, while leaving the door open for some possible future chicken-driven sequels. I snorted with laughter many times while I was reading this quirky twist on a novel about prejudice. 17 year-old Ben Fletcher is put on probation after knocking down a lollipop lady (aka crossing guard) and is obliged to write a journal which, along with correspondence with his probation officer, forms the narrative. As part of his punishment, he is obliged to take a class at the local community college, and opts to take knitting, which it turns out he not only has a natural talent for, but it also helps soothe his anxieties. Of course, he is mortified by the thought of friends, family and the girl he has a crush on, let alone the school bullies, knowing that he is knitting. So, with a wink to more serious addictions and secrets, Ben takes his knitting underground – lying to everyone, keeping his knitting in a box under the bed and hiding his copy of Knit! in a lad mag. This is a British book, and the ARC I read was stuffed full of Britishisms and cultural references (Boris buses? Martini Rosso? and I’m not sure Graham has quite the same connotations) that could possibly go over the head of many American teen readers. There were a few attempts to Americanize things – custard creams suddenly became Golden Oreos and Heston Blumenthal is qualified rather clunkily as an “experimental chef” for example, but I don’t know how much further the published version will have changed. Though this looks and reads like a middle grade book, there is some fairly raunchy content. 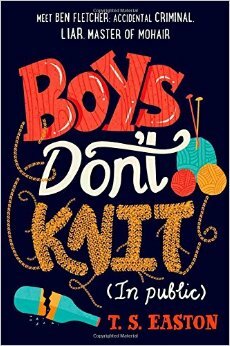 However, and because “everything has to have a knitting analogy,” it will have teen readers in stitches.